It's the season of overflowing market bags, heavy CSA boxes, and gardens run amok. Alexandra Stafford of Alexandra Cooks is showing us how to store, prep, and make the most of the bounty, without wasting a scrap. Today: Learn the best ways to store, prep, and cook this late-summer vegetable, then dig into a classic Eggplant Parmesan from The America's Test Kitchen Family Cookbook. Is there a vegetable more polarizing than eggplant? More capable of inciting disputes over its preparation? More likely to cause adults and children alike to scrunch their faces in disgust? Never have I heard or read more contradictory commands about how something should be treated. NEVER salt. ALWAYS salt. NEVER fry. ALWAYS fry. NEVER peel. ALWAYS peel. Because eggplant can be anything from bitter and greasy to meaty and rich, people seem to either hate or love this late-summer vegetable (actually a fruit, a member of the controversial nightshade family). And while I have no doubt that some people genuinely dislike eggplant, I fear that others may have written it off years ago when they were, say, eight, or maybe after a bad experience with oil-laden eggplant parm, and they haven't given it a chance since. 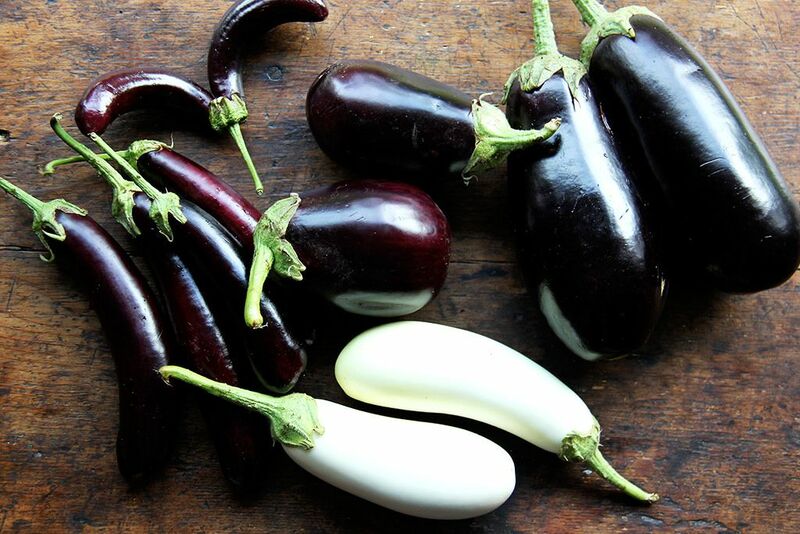 And this is a shame, because how eggplant tastes is directly related to how it is prepared, and when it is treated properly, it tastes sweet and mild and not a bit bitter or oily. Certain preparations, in fact, need little or no oil at all. When roasted or charred, for instance, an eggplant's skin will blacken, leaving its flesh creamy and scoopable, a near-purée ready to be mixed with minced garlic, a splash of vinegar, and lots of chopped herbs. When sliced into rounds or halved and grilled, the meat softens and assumes a smokiness, a perfect base for a smear of tangy miso sauce or a drizzle of salsa verde. And when thinly sliced and layered into a gratin with tomatoes and onions, it melts into silky, fork-tender rounds. More: Learn how to make your own salsa verde here. It's when oil is introduced to the preparations that the trouble begins. Eggplant is a sponge and, given the opportunity, will soak up any oil in reach, which is why sautéing and deep-frying can leave it tasting heavy and greasy. Salting leaches out moisture and condenses the flesh, reducing its tendency to absorb and helping it stay crisp and light. This, I learned from The America's Test Kitchen Family Cookbook, is an important step toward making a good eggplant Parmesan. But the real key to achieving eggplant Parmesan success is skipping the stovetop, frying-in-batches method altogether. 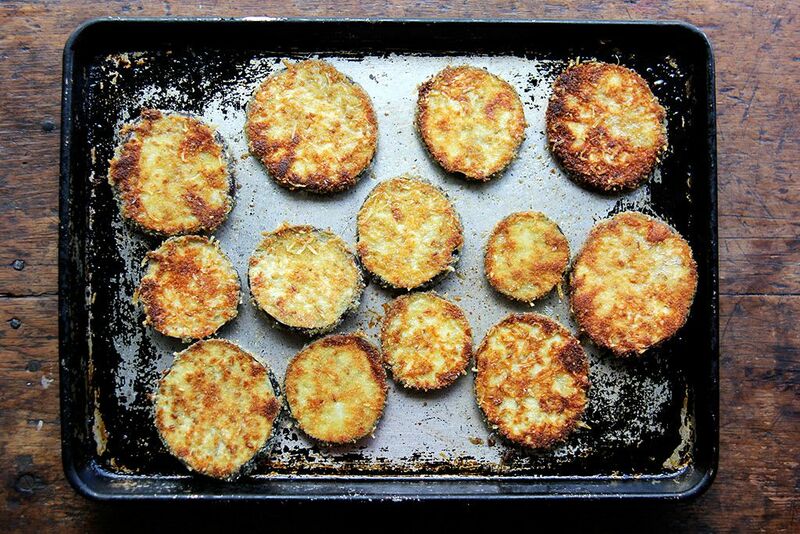 America's Test Kitchen's method calls for baking the breaded eggplant on two preheated baking sheets, a step that not only saves time but also produces eggplant with superior taste and texture, emerging from the oven evenly golden without a hint of greasiness. More: Use your oven to master another traditionally fried food: French fries. These light, crisp rounds are irresistible, which will tempt you to stop right there, pile them onto a platter, sprinkle them with basil, pass some sauce on the side, and call your efforts done. But pushing on with this labor of love has a reward, too: a bubbling, comforting casserole layered with late-summer flavors that just might unite eggplant haters and evangelists alike around your table. If your kitchen is cool enough, you can store unwashed eggplant out of the fridge on your countertop for two to three days. Eggplant is best eaten within a few days of being picked and purchased, but if you will not be eating it in the short term, store the eggplant in the fridge -- as with tomatoes and peppers, the cool temperature of a refrigerator is not ideal for preserving flavor and texture, but it will slow the eggplant's deterioration. Trim off the green cap and stem. Peeling eggplant is most often unnecessary, though if a recipe (for, say, a soup or purée) calls for it, use a peeler or paring knife. Eggplant can be cooked in so many ways -- roasted, grilled, sautéed, braised, deep-fried, microwaved -- and depending on how you cook it, you may or may not want or need to salt it. Generally, when roasting, grilling, or braising, salting is unnecessary. Because eggplant will act like a sponge when given the chance, however, salting is a good idea before any type of frying. Salting removes moisture (and apparently any bitterness) and condenses the flesh so that it is less likely to soak up oil when it is sautéed or deep-fried. 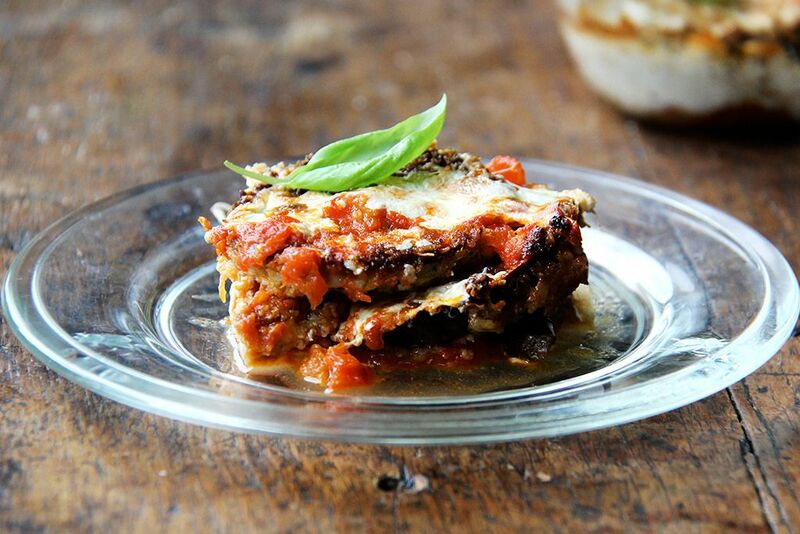 There are a few dishes that come to mind at the thought of eggplant: ratatouille, baba ganoush, caponata, pasta alla Norma, and of course, eggplant Parmesan. Roasted: Eggplant can be roasted whole at 400º F or so until it nearly collapses, about 30 or 40 minutes. The flesh then can be used as a spread or dip or as the base of a soup, stew, or croquette. Eggplant can also be diced or sliced or cut into wedges, tossed with olive oil and salt, and roasted until tender (25 minutes or so). Serve the roasted eggplant on its own or as part of an antipasto platter, fold it into pastas, layer it over pizza dough or in a vegetable tart, or toss it with other roasted vegetables and serve it as a salad. Halved eggplant can be stuffed with ground meats or rice or other grains and vegetables and roasted until everything is cooked through. 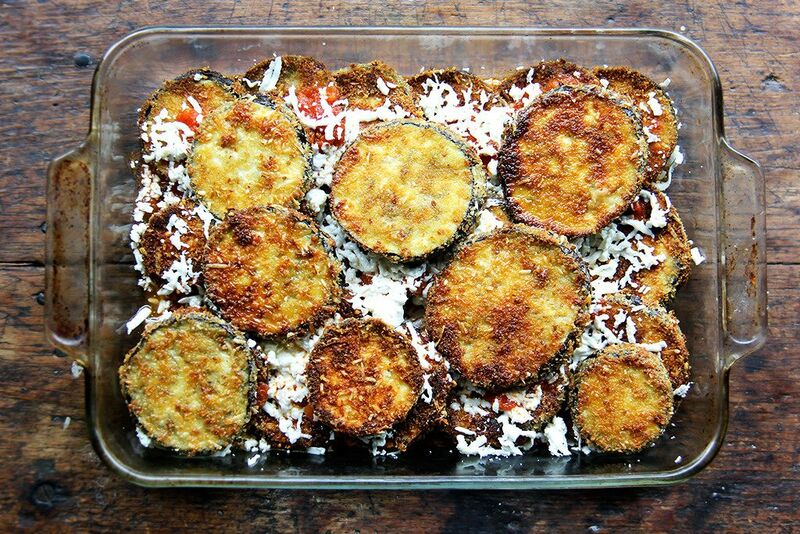 Thin slices of eggplant can be layered with onions and tomatoes and baked into a gratin. Eggplant can be grilled whole until its skin completely blackens. When the skin is removed, the flesh will be soft and creamy but will taste smoky and can be mixed with garlic, herbs, oils, yogurt, and tahini for a dip or spread, or can be puréed with broth and used as the base of a soup. 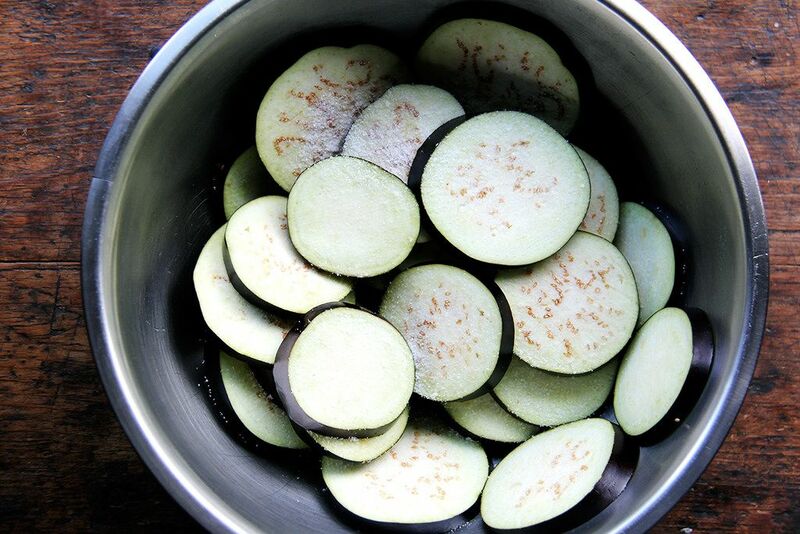 Eggplant can be sliced into rounds or, if small and slender like Japanese eggplant, halved lengthwise, and grilled. Toss pieces with olive oil and salt and pepper before grilling. Serve with salsa verde or chermoula or a smear of miso sauce: a mix of miso, sugar, rice wine and sesame oil. Eggplant can be diced and pan-fried until golden and used in countless ways, namely in a hearty vegetarian sauce. Eggplant rounds can be tempura battered and deep-fried -- the Japanese variety is particularly good for this. 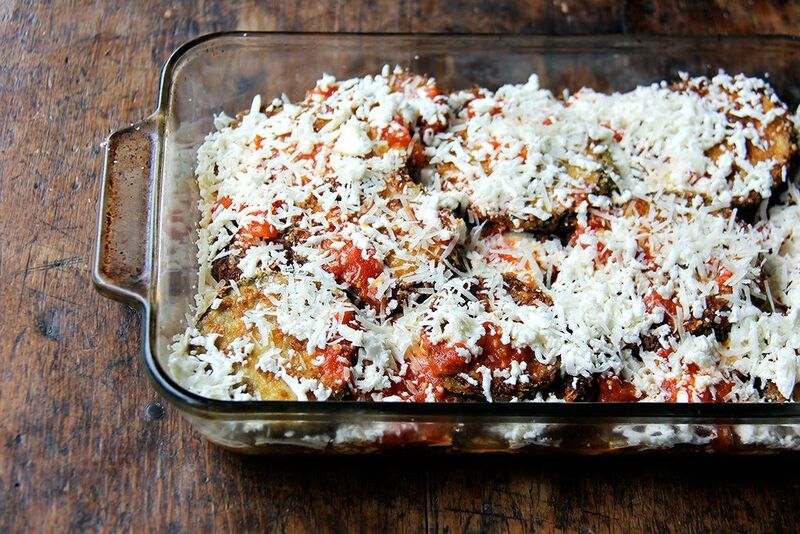 Lengthwise-sliced eggplant pieces can be pan-fried (or grilled or roasted or broiled), stuffed with ricotta or other cheeses, rolled, and baked into involtini with tomato sauce. Halved Chinese (or any long, slender variety) eggplants can be marinated and microwaved until tender. Finally eggplant, like so many vegetables, can be pickled. Tell us: What's your favorite way to cook eggplant? FYI: I don't know if this holds true for anyone else, but I'm finding that the Japanese eggplant I grew this summer (and which keeps on producing!) keeps better in the fridge if I put them in a very loosely closed plastic bag. By loosely closed, I mean a single twist then fold under - nothing complicated, nothing tight. Good to know! I did find that the Japanese eggplant I left out tired more quickly than the others — the skin started softening a bit. I'll try the fridge next summer. 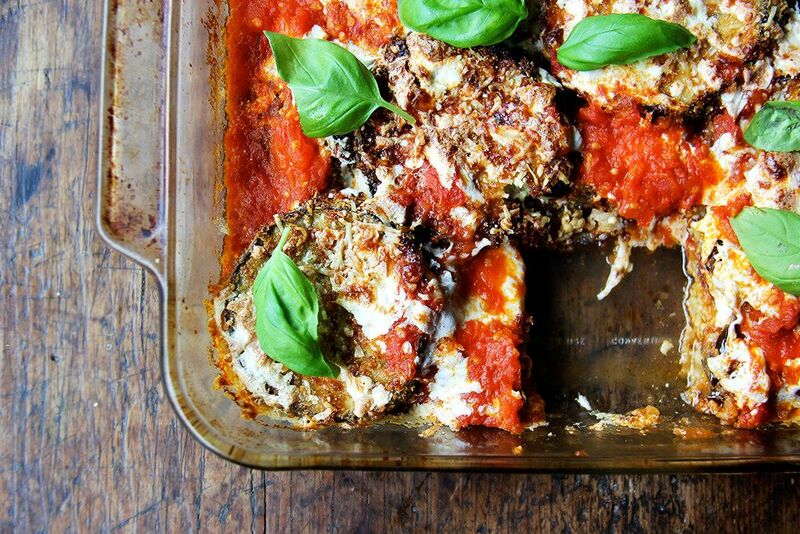 Reading Alexandra's articles and all the comments has give me lots of ideas for dinner ... Perhaps a spin in eggplant and tomato gratin using the dollop of fresh pesto sitting in my fridge ... Mmmmmm. Alexandra, on another note: do you have plans for a piece on butternut (or any winter) squash? I could use your help. A volunteer butternut took over my compost heap this summer and I now have a couple dozen plus curing in my barn aisle. Yes! That sounds amazing. Chez Panisse vegetables has a wonderful eggplant, tomato and onion gratin that would only be made more irresistible with a dollop of pesto. Yum. Each will make a small dent in your supply, but maybe you could make a couple of double batches? What luscious soup recipes, and I'm a huge fan of making big batches. I look forward to more! If you are grain-free what do you suggest as subs for flour and bread crumbs? This is definitely not my expertise, so if anyone else in this thread has any ideas, please jump in, but I'm wondering if you could use coconut flour in place of wheat flour? I've never used this, so I hope the flavor isn't too strong bc it really isn't a natural pairing here, but that could work. And for the breadcrumbs, maybe some sort of toasted and ground nut? Almonds or walnuts? I wish I knew more! I do a similar eggplant parm, but I don't flour the rounds. I salt and drain the thick-ish rounds, then bake on parchment-lined sheet pans until nice and soft. Then, build it, lasagne-style, with grated mozz, some parm, and Marcella's sauce. Bake till bubbly. Makes great leftovers. Yum, so do you skip the breading altogether? Love the sound of this. Yes, true eggplant is like a sponge and will absorb tons of oil if you fry it, that is why I do not fry my eggplant any more. Instead after I have sliced and salted and let it drain for a few hours, I rinse it out and pat it dry with paper towel. Then line a cookie sheet with parchment paper. Place slices of eggplant and brush them with olive oil. Broil till golden brown, then flip slices over and repeat the process. 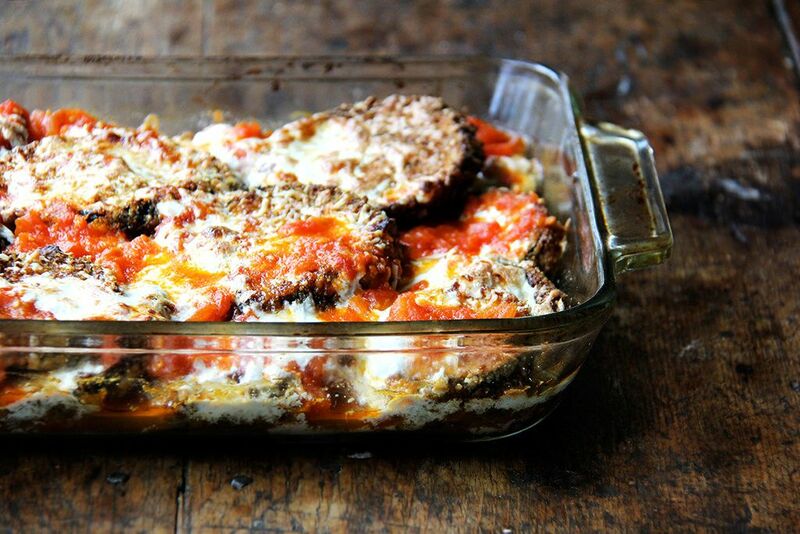 This makes a great preparation for proceeding with your recipe of eggplant parmegiana. As for Angela's tomato sauce, no recipe needed. If you have a ton of tomatoes, quarter them, boil them for about 1/2 hour with a little basil and cook till slightly condensed most of the water has evaporated. Then pass them thru one of those European strainer and you have basic tomato sauce. Of all the egglant cooking methods I tried these past few weeks, I did not get to broiling, and I'm glad you brought this up, because it is a great technique. Deborah Madison gives guidance for broiling in her Vegetarian for Every Day cookbook, which I have been loving this summer, and she suggests a ton of sauces to serve with the broiled eggplant rounds — seems like a really handy technique. Thanks for bringing this up! Also, do you not bread your eggplant for eggplant parmesan? Would love to try that. Any recs for homemade tomato sauce recipes? Am particularly interested in the one pictured (of course), for this weekend when we load up with cheap tomatoes in bulk at the market. 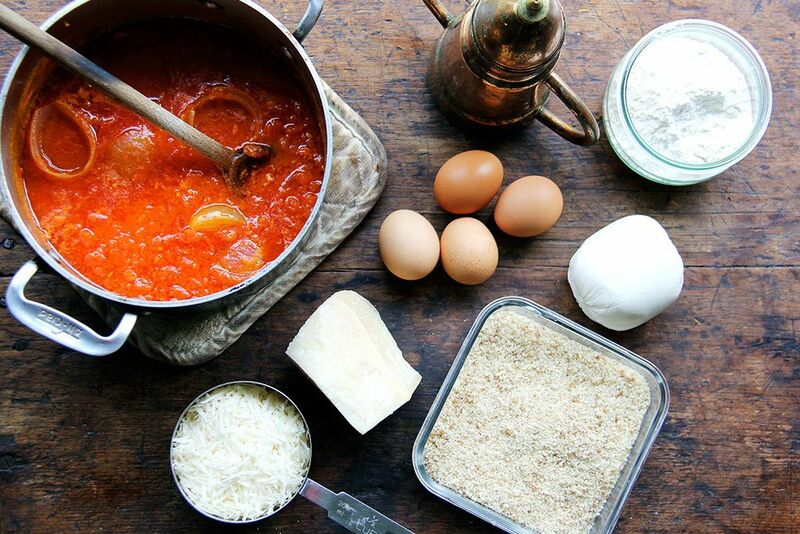 Hey Angela, Nicolina gave a great idea for a simple sauce above, but if you are looking for more specific instructions, the Marcella Hazan tomato sauce is completely delicious, also really simple: https://food52.com/recipes/13722-marcella-hazan-s-tomato-sauce-with-onion-and-butter That's what I made here. Once you make the sauce once or twice, you'll never have to look at the recipe again. It's kind of life changing. This looks great! I love the oven fry method. Roasting is hands down a game changer with the eggplant. Last night I made a simple martha rose shulman/ny times miso glazed eggplant that used so little oil and that is great for those without a grill. Just roast a long Japanese eggplant halved, cut side down, smear with the miso sauce and broil a minute or two. Must try your parm. Awesome! I have a few Japanese-like eggplant on hand that I need to eat immediately. I bought them at the farmers' market and apparently they are called finger eggplants. They are long and slender, and I think will do the job. I have just discovered the wonderful world of miso sauce, but I really like the sound of this roasting-then-broil method. I was being lazy and used a stove-top grill pan, which didn't work so well, though the sauce was delicious. Going to check out MRS's recipe now. Thanks! Hi Alexandra. About storage: when I don't get to use eggplant in say, two to three days I usually will grill it. That way, half-prepared, it stores much better in the fridge. So smart! I have been learning so much about storing vegetables these past few months. So many vegetables that I thought were fine to store in the fridge — peppers, eggplant, basil for example — I've realized shouldn't be. But cooking does seem to do something to increase the storage longevity. Thanks for the great tip! 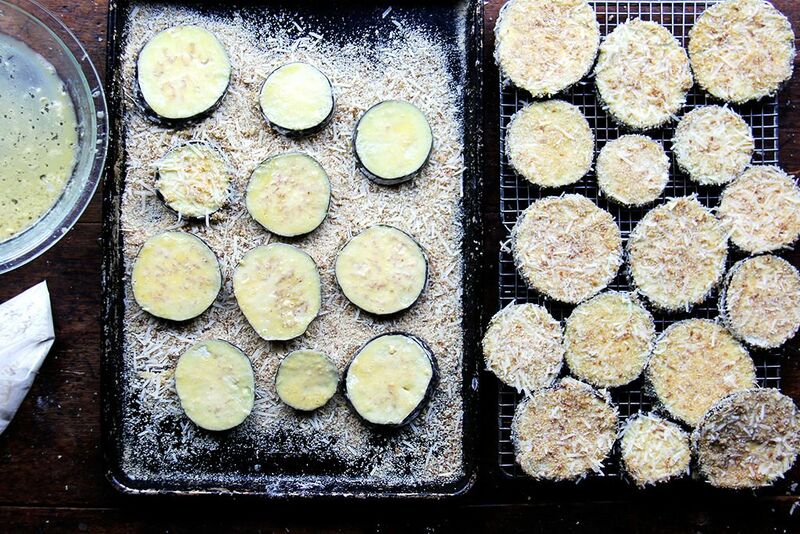 Diana Henry's Salt Sugar Smoke has a recipe for Grilled Eggplants in Olive Oil that is simple and delicious. Slice, salt, rinse, dry, then grill the eggplants. Heat olive oil and thyme in a saucepan, then add the eggplants and a little white wine vinegar. Bring to a boil, then immediately remove from heat. Once cool pack the eggplant slices into a jar and cover with the strained olive oil. Yep. Room temperature as part of an antipasti spread. I've eaten it with bread and lemony-herb feta as a sort-of sandwich. Oh that sounds so good. Love the idea of paring it with feta.